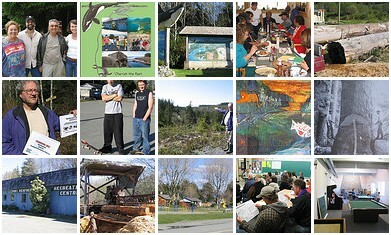 The project was funded by the Queen Alexandra Foundation for Children QA hired James Pratt and Maeve Lydon in December 2004 to conduct a Capacity Building Project in the community of Port Renfrew, building on several previous years of community development work between the QAF and the community to support children and youth. Other contractors on the project included Charles Burnett and Nedjo Rogers. The project was based in the GroundWorks Learning Centre in Victoria from January to September 2005 with Maeve Lydon providing additional services to complete the project in the fall of 2005. 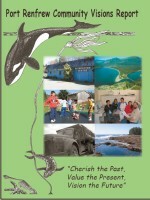 The Port Renfrew Youth Advisory Committee (YAC), a multi-stakeholder group in the community, was the local governance structure that worked with the Project. A volunteer group from the YAC, which called itself the Visions Team, worked on the Capacity Project and met each month from January to June to guide the project. Alternate monthly meetings continued with the Port Renfrew YAC, which was re-constituted and re-named the Port San Juan Advisory Ctte. by the end of June 2005. • Build on the work done so far by the Committee, on the recent needs assessment by the Pacheedaht Nation, and on other existing information about demographics and service needs. • Develop an inventory of existing health services, social services, and economic development resources in the community. • Prepare a proposal to the Queen Alexandra Foundation for Children, identifying how the community proposes that $150,000 be used. Goal: to better understand needs of the community and to rally support and funding-raising for a new Recreation Centre. Click on the tiled images below to view a slideshow of images from the PR/PFN Visions Project (images stored on Flickr.com).